Just dropping in to post another tag that I made for Monday's demo. 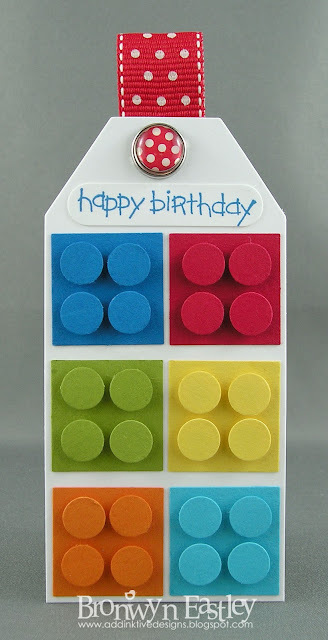 I've seen so many Lego inspired cards on Pinterest that I thought I would make my own little tag using SU's 1" square punch and the Itty Bitty Circle Punch. I think it turned out quite cute! Judging by the reactions it was one of the favourites of the day. PS: A big thank you to K. Dunbrook on Splitcoast who always lets people know if their card was chosen as a favourite for the week/year. I was honoured to receive both awards. Much appreciated! BIG CONGRATULATIONS....your card is a CAS FAVORITES: The Best of 2012. Happy New YEAR!!! This is just THE cutest thing, Bron!! Love the bright, happy colours (and the polka dot brad)! Oh, wow! I love this cute little tag...so creative and fun! This is so adorably cute! My older boys were lego fanatics! Great tag for a lego gift! HOW FUN!!! Bronwyn this is such a cute idea! Your lego tag is brillant! So clever, love the colors too! Thank you for stopping by my blog and for the nice comment! Very cute! I love the bright colors! I happened to have posted a Lego card today too! Didn't know they were popular right now...I'm in good company! TFS!